We have just released an updated version of 7notes v1.1 for Ipad! With the recent release of iOS5, our developers wanted to optimize 7notes to fit this new experience. 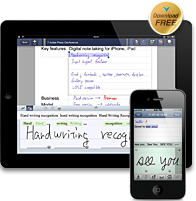 The updated version now includes adjusted dialog windows for iOS5 compatibility and enhanced connection with Evernote. We hope you enjoy it! We just released 7notes 1.4, an update version of the popular application for iPhone that includes new features and functionality to make it easier for consumers to create, share and store notes and memos.